Have you ever been asked to take your shoes off at somebody’s house? If you have stinky shoes that you just can’t get a handle on, there is nothing more embarrassing than to have to expose your stinky feet to the world. A little while back we reviewed the best foot care products to keep your feet from smelling and to keep them healthy. If you followed that advice, your job is only half done. Even when you take care of your feet they will still sweat. And that sweat will make its way into your shoes where the bacteria will have a feast. That’s what ends up causing the smell. 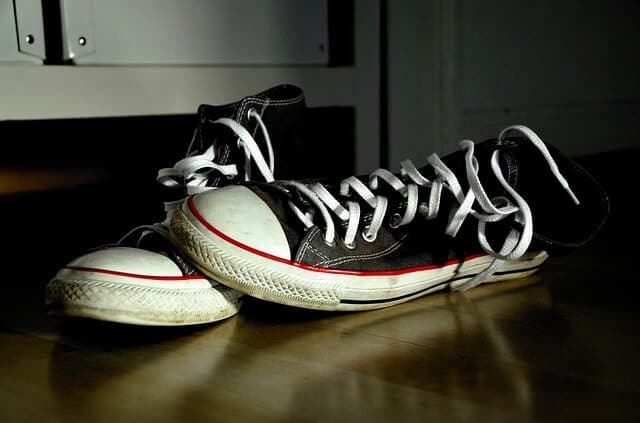 To really keep foot odor at bay, you also have to deodorize your shoes. This is especially important if you work on your feet or work out a lot. In this article, I will review the best shoe deodorizers to eliminate odors. For those that don’t have time to read about smelly shoe remedies, (not the sexiest of topics to read about, for sure!) I made a comparison table so you can see the best options at a glance. Everybody else can scroll down to read the in-depth reviews to see which of the best shoe deodorizers is best for your situation. Naturally disinfect and sanitize your shoes without harsh chemicals. An all natural way to kill the bacteria in your shoes and keep them fresh. A great way to keep your shoes smelling nice and clean after you’ve disinfected them. Those that are looking to use non toxic products can deodorize without any chemicals. A passive way to keep your shoes dry and fungus and bacteria free. Anytime you are trying to eliminate an odor, it is best to get rid of the cause, otherwise, you are just masking a smell. Sometimes that just makes things worse. If you remember the cause of body odor is not from sweat, but, from bacteria eating that sweat, then it stands to reason that you need to do something about the bacteria. Using an antibacterial spray is a very effective way to put an end to foot odor in your sneakers. When using a spray for stinky shoes, try to use one that can kill bacteria, as well. Another way to reduce the odor is to absorb the odor along with moisture. Charcoal based shoe fresheners are the way to go here. Charcoal can absorb odors and moisture and keep your sneakers from getting stinky in the first place. Can you use talc to get rid of shoe smell? Perfumed talc is an example of masking an odor. It might work for a little while, but by the end of the day, your shoes will likely start to stink again. Instead, if you want to use a powder, then look for one specifically that is a shoe or boot deodorant that does more than just cover up the smell. If the powder can absorb odors then that is a good one to go for. Look for zinc-based powders that can reduce the bacteria in your shoes. Lastly, apart from those best shoe deodorizers there are also odor eater inserts or insoles that you can place in your shoes to keep the smells at bay. I will go over each of the best shoe deodorizers in all of those categories so you can decide for yourself how to deodorize your shoes. 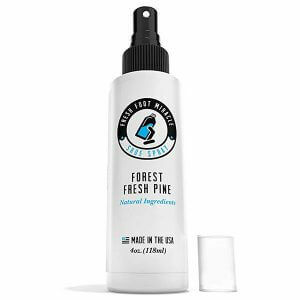 If you’re going to freshen up your shoes with a good sneaker deodorizer, you may as well kill a few birds with one stone and make sure to use only one of the best shoe deodorizers out there. If you have spent any time in a gym shower then you are always at risk of getting athlete’s foot if you haven’t had it already. 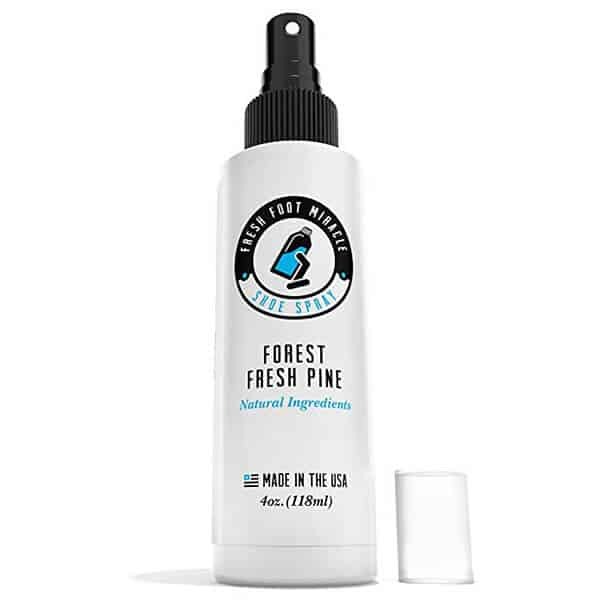 With this spray, you have a fungicidal and bactericidal treatment for your sneakers that is effective against germs, fungus, bacteria, mold, and mildew. Some of which will cause athlete’s foot, like ringworm. Those things not only cause some health problems but are at the root of why your shoes smell. Get rid of those problems by using the best shoe deodorizers and your shoe odor is solved. The best part is that it is all natural. There aren’t any chemicals that can cause some unwanted side effects. It does have a strong pine scent, which is an ingredient that kills bacteria. For that reason, I wouldn’t call it a deodorant as the scent is slightly like floor wash. It is very effective at getting rid of the stink of your shoes, though, so the scent of pine is a big improvement over the smell of your feet. 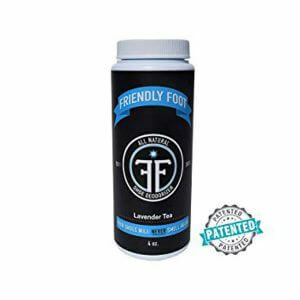 If you have tried this or other natural foot deodorizers without any success, then you may need to use a more serious chemical based one like 10-Seconds Shoe Deodorizer and Disinfectant from Amazon.com. It is an effective treatment against MRSA, which is easily spread through gyms. 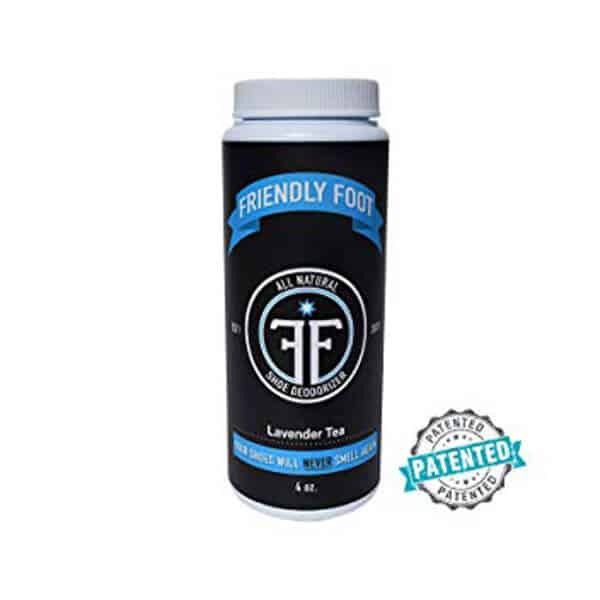 This is an all natural shoe odor treatment that is antimicrobial, antifungal, antiviral, antibacterial and antiseptic. You may be tempted to think you can just sprinkle some baking soda in your shoes to absorb the smell. While the baking soda will absorb much of the odor, it won’t kill bacteria and other microbes like this powder does. With a blend of essential oils like tea tree oil that kills bacteria, and eucalyptus oil that inhibits the growth of bacteria you an neutralize the odors very effectively. The addition of a mineral borate to kill fungus effectively lays waste to all the odor-causing characters in your shoes or sneakers. Like other best shoe deodorizers it won’t work right away, though, since again, it isn’t masking odors. Give it a few days to a week to kill all the microbes and you will notice a huge difference in the smell of your shoes. A couple of quick spurts per day while your shoes are still a bit sweaty and you’re good. As far as a scent, it has a slight lavender fragrance due to the essential oil present, but it is not very noticeable. This can also be used on sandals and flip-flops, but use a lot less than you would for your shoes. There will be a bit of residue visible on sandals so go easy to prevent that from happening. Otherwise, it is ideal for any type of shoe, whether it is for your work boots or gym sneakers, you can use this to great effect. A can should last you for a few weeks. Do sneaker balls actually work? Well, yes and no. These work well at deodorizing your sneakers for a fresh scent, but they don’t kill the bacteria like other best shoe deodorizers do. The way I would use these is in conjunction with a powder or spray. Since the ones I already mentioned don’t give off much of a fragrance, you can put these balls in your sneakers when you’re not using them as a freshener to give them a nice scent. The scent is fresh without a specific aroma. Think of it like a care freshener and you get the idea of what they smell like. This is why I think it’s important to use an antibacterial first, as this scent mixed with the sweaty smell might be unpleasant. They last quite a long time. In fact, they claim to last 2000 hours before they need to be replaced. That’s roughly 3 months. There, I saved you having to do the math! These can also be used in gym bags and lockers to keep them smelling fresh. 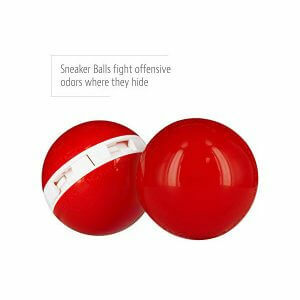 If you’re not crazy about the idea of using the sneaker balls to deodorize your shoes since they don’t really eliminate the odor, then you may want to try these inserts along with other best shoe deodorizers. 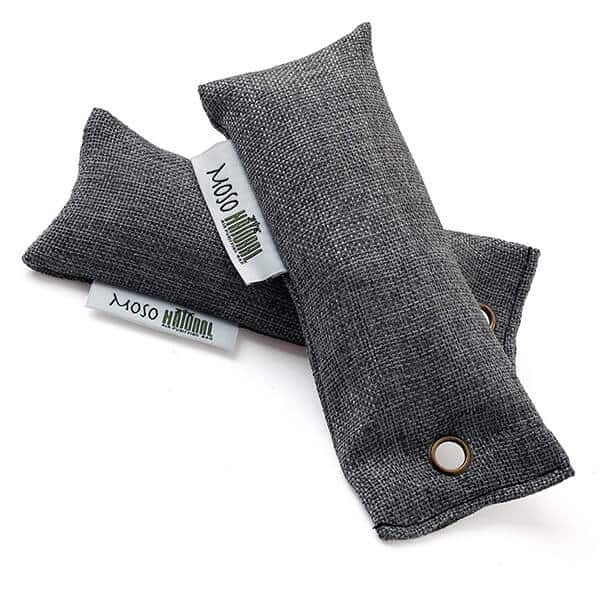 For a shoe odor treatment that is simplicity itself, there are these charcoal odor absorbers. They only have one ingredient. 100% bamboo activated charcoal. Though they aren’t antibacterial or antimicrobial, they do a good job of preventing mold, mildew, bacteria, and fungus by absorbing excess moisture before it has time to ruin your shoes. 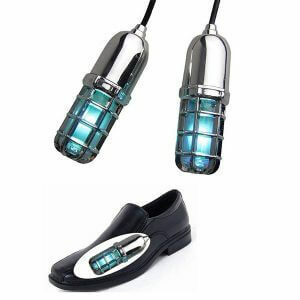 Just slip them into your shoes as soon as you get home while they are still sweaty and leave them there overnight. They will last 2 years with the occasional recharging. To reactivate the charcoal, you just need to put it in the sun. Once a month or so, put it in the sun for a couple of hours. Even if it is cold or cloudy, the UV rays will work to open the charcoal back up again. Since it is all natural, when the 2 years is up and the charcoal is no longer able to get reactivated, you can compost these and use them in your garden. You can use these in any type of shoe, even sandals. If you are somebody looking to eliminate as many chemicals from your life as possible, then these are a great solution as a natural way to kill shoe odors. These are not only chemical free but also fragrance-free and nontoxic. For another non-toxic and chemical free shoe odor treatment, then there are these handy insoles that just slip into your shoes. There are no ingredients in these. Just natural cedar and cotton. The cedar absorbs the moisture from your feet and wicks it away to the cotton layer underneath. This prevents the moisture from getting into your shoes and reacting with any bacteria. If your shoes are already disinfected, then these will also prevent bacteria from forming and causing the smell. There is a pleasant cedar fragrance that comes out which also keep your shoes smelling fresh. Similar in a way to how the cedar shoe trees work to freshen up the smell of your shoes while they sit in a closet. Only these are worn so it provides non stop deodorizing while you’re at work or on the go. Though these can work without any other products, it is important that your shoes are already bacteria free. I would definitely use a spray or powder to kill the bacteria and then start using these since they don’t actually reduce microbes. They’re available in 14 sizes and will last you approximately a couple of months. To ensure that they keep working, you can wash them on occasion with warm soapy water. Then just let them dry before you insert them again. If you already wear orthotic insoles, you can simply place these right over the top of them. They may not last quite as long as they should as eventually they may start to crack due to the fact they will bend to fit the insole underneath. A good runner-up for best shoe deodorizers insoles are these Kaps Insoles Bamboo & Alum Fresh from Amazon.com. The alum in them will kill bacteria and prevent them from coming back. These may seem like some kind of new age type of system that doesn’t actually work, but UV rays do, indeed sanitize surfaces. Actually, let me clarify that. They won’t actually kill much bacteria, but they do prevent it from growing on any surface. If you have successfully disinfected your shoes using one of the best shoe deodorizers, then you can use these inserts to keep the bacteria from forming. They will also help to dry out your shoes quickly so they won’t get any mold, mildew or fungus in addition to the bacteria. They also dehumidify your shoes quickly which makes for an inhospitable place for bacteria and fungus to grow. It’s as easy as it gets to keep your shoes sanitized. You pop them into your sneaker, shoe or boot and turn it on. After 15 minutes, it turns itself off automatically. Do this as soon as you take your shoes off and they will get dried out and disinfected in those short 15 minutes. If you suffer from athlete’s foot or just stinky feet, then this is a great way to keep that from coming back. If you’ve read this far it means you probably have some pretty smelly feet and are desperate for a solution. I hope this article gave you something to think about and can send you on your way to odor free shoes and feet. Don’t assume that because you haven’t found the right treatment or solution that there isn’t one for you. Start with taking care of your feet, then make sure your shoes are disinfected and deodorized using these best shoe deodorizers. Do this and you will finally see some results. If you have to throw your shoes away, make sure you get something as breathable as possible. If you have any other questions about the best shoe deodorizers discussed above, let me know by leaving a comment below!